We highlight "When You're Mine" because it is a great song, but also because it heralds the December 8 arrival of Anglesea, a new album from NYC duo Fascinations Grand Chorus. The song has elements of power pop and bubblegum. The lyrics are sweet and yearning, but with a hint of uncertainty. This is a band that was good "out of the box", but our ears tell us they are getting even better. Anglesea will be released on Silent Stereo Records, and can be pre-ordered at the link below. Around WYMA offices we know Declan Welsh & The Decadent West as reliable and fierce anti-fascists. But today we are showcasing the Glasgow quartet's talents with respect to the personal side of life, as today is the release day of their new single, "Useless". Passion, vulnerability, and longing are on display in fine fashion; check out your favorite digital outlet. The band are Declan Welsh (vocals/songwriting), Duncan McBride (guitars), Ben Corlett (bass), and Calum Murray (drums). Well, well, well -- here is a big load of rot. 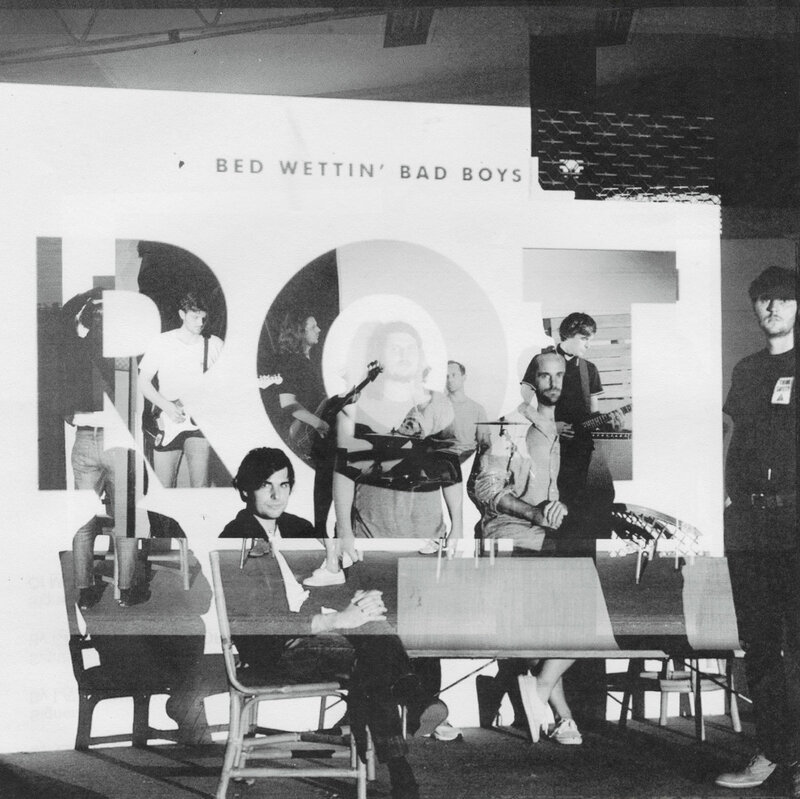 Specifically, the 11 tracks of heavy, hooky, aggressively-jangling garage rock which comprise Rot, the new album from Sydney's Bed Wettin' Bad Boys. Introspection can come at you a number of different ways, and a listener can choose his or her poison. But we have a weakness for well written songs crafted by musicians with enough experience to know what they are talking about (and know what they don't know) and uncompromising, full-bore performances. And that is exactly what you get with Bed Wettin' Bad Boys. This is a face-melting treatment with a pop-glaze, and that is hard to find and treasured when you have it in your hand. Go ahead and ignore the band's name, but don't ignore this music. Bed Wettin' Bad Boys is Joe Sukit of Royal Headache (vocals/guitar), Ben Warnock (guitar), Nic Warnock (bass), and Doug Gibson (drums). Rot is out now via R.I.P. Society in CD, vinyl, cassette and digital formats. The point of purchase depends on where you hang your hat; see the links below. Today's word is Shame, but don't worry. We aren't addressing what you said at the pub last night, or your snitch of the last cookie (although that was bad form, indeed). We are talking about South London's Shame. The five-piece's debut album Songs of Praise (given the title, we anticipate some sincere devotional numbers that really make us think) will be released by Dead Oceans on January 12. The ten songs promise grit and post-punk energy, but we will have more on that later. For now, listen to album track "One Rizla", or watch the video below. Shame is Eddie Green, Charlie Forbes, Josh Finerty, Sean Coyle-Smith, and Charlie Steen. Certain bands have the unique ability to punch you in the gut while soaring melodically. The Twilight Sad has been such a band, and more recently, Mt. Doubt has proven themselves in that channel. Perhaps the Scots are predestined to thrill in this manner, but whatever the source, we are big fans. If you are a regular reader, Mt. Doubt needs no introduction. For those who are less familiar, know that the Edinburgh-based project was founded in 2014 by Leo Bargery. Prolific of late, Mt. 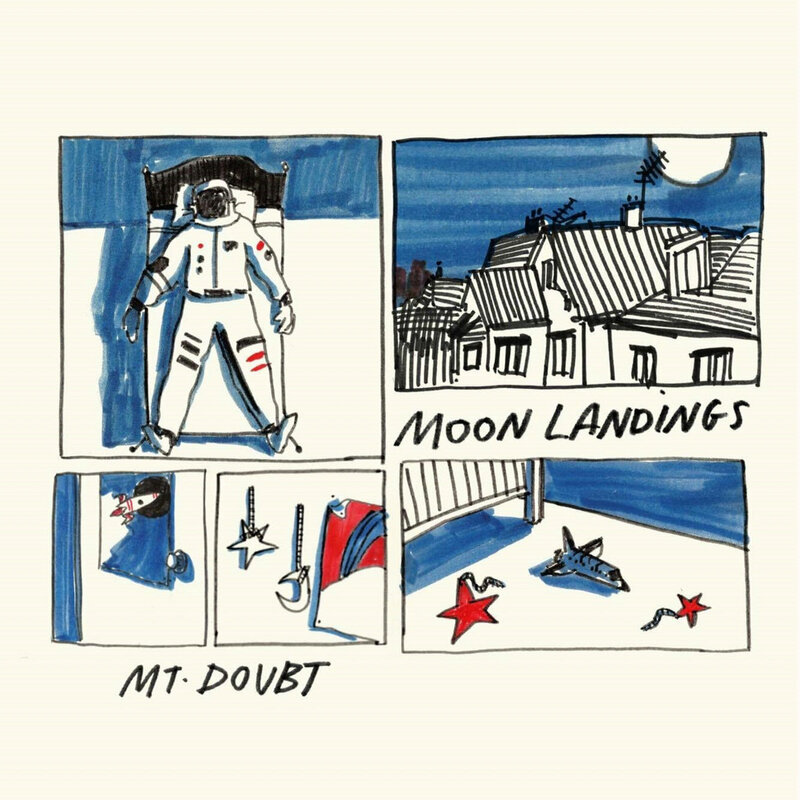 Doubt has released the new Moon Landings EP. On this effort, Leo is joined by Ryan Firth and Annie Booth. You will find the expected mountain of doom, heralded by Leo's baritone, but also rays of almost sunny pop tones. It is a winning combination and a welcome expansion of the band's sound. Moon Landings is out now via Scottish Fiction. Variously termed rummage sales, yard sales, garage sales, jumble sales, among other terms, when someone clears out their attic, basement, closets and other collection points, the rest of us have an opportunity to find treasure. In the case of the UK's Martin Newell, recording as The Cleaners From Venus, a long career in music has produced a bumper crop of outtakes and other musical odds and ends. And in a fit of housecleaning, he has assembled 17 tracks from 22 years of work and packaged them as Martin Newell's Jumble Sale. So this will be one of your easiest jumble sale shopping excursions -- one stop shopping for a pre-selected set of songs. There is no need to sort through boxes of crockery, loud holiday sweaters, or vintage roller skates. Even with odds and ends of a recording session, Martin's keen observational skills, melodic sensibilities, and deft wordsmithing produce gems that others in the business should envy. Welcome to the jumble sale! 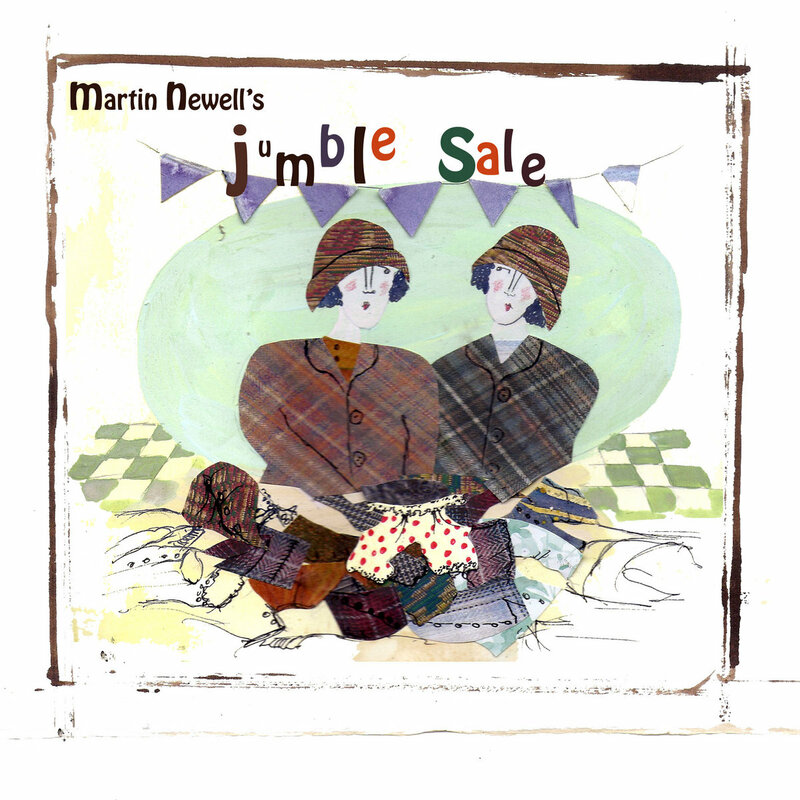 Martin Newell's Jumble Sale is out now as a digital release, as well as a limited run of CDs. Check out the Bandcamp link below or visit your preferred online store. We aren't the maudlin types around here. In fact, we tend to be quite cheery in nearly all circumstances. Nevertheless, we are going to start out the week with Sob Stories. And what a great set of sob stories they are -- six tracks of chunky riffs, snarling leads and tales of failed love, dark observations, and dessert. Yes, we wrote "dessert", deal with it. The songs are concise and energetic, featuring frontman and songwriter Joel Cusumano's baritone growl and a band that sounds more like mid-career Clash than any band deserves to. It isn't every day you can find sob stories that make you happy. 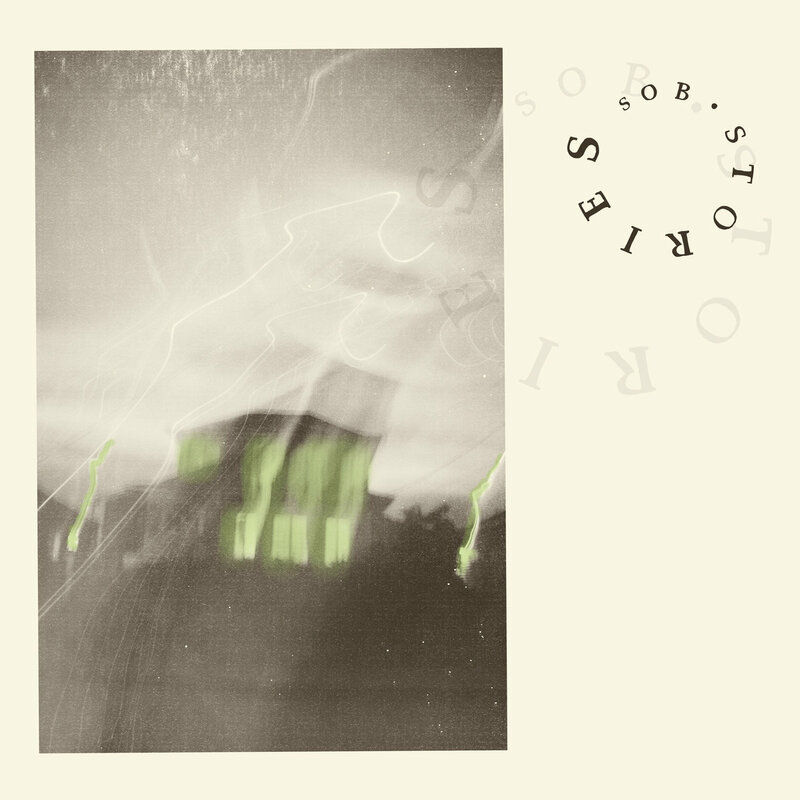 Sob Stories EP is out now via Emotional Response Records in digital and vinyl formats. In addition to Cusumano (ex Talkies and Terry Six), Sob Stories includes member of Razz and Cocktails.